This weekend, Curiosity will attempt to sink the drill into the complexly-layered "Duluth" block. Before that, she will gather more data from the "Blunts Point" member rocks in front of and around us. The Duluth target, neatly cleared of dust by the DRT in yesterday's plan, will be observed by ChemCam's passive mode and Mastcam's multispectral mode to gauge what iron mineralogy was hiding beneath the target's thin veneer of dust. ChemCam will shoot three targets to learn more about the chemistry of the layers within the Duluth block and similar blocks around it. Within the Duluth block, ChemCam will target "Chisholm," the delicate layer curling up above the top of the Duluth block, and "Aitkin," another layer jutting out from the side of the block. The "Buhl" target sits off to the rover's right and represents another example of the Blunts Point member for ChemCam to sample. 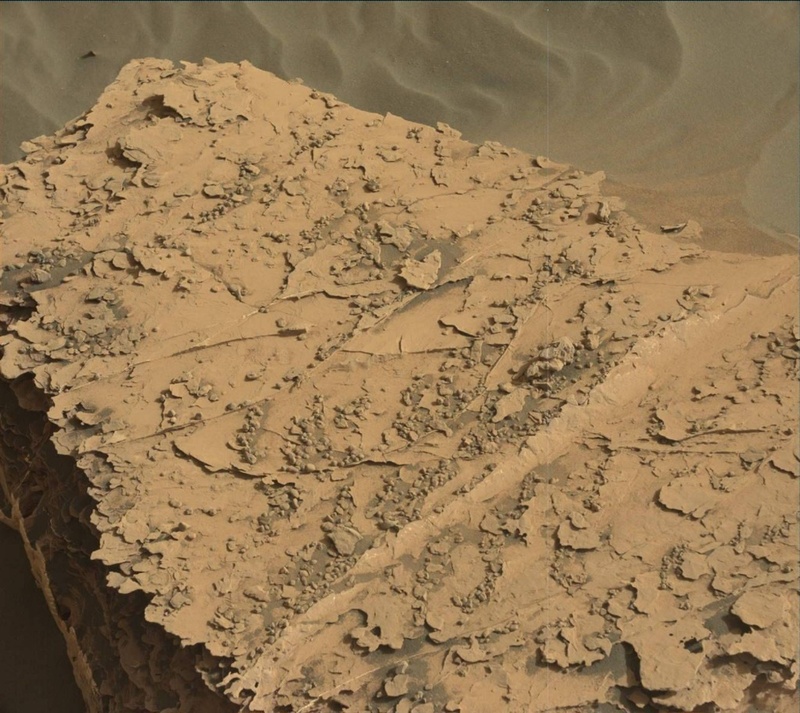 Mastcam will then image two large blocks dubbed "Kabetogama" to learn more about the intricate layering of the Blunts Point member. Before drilling, Curiosity will also give the sky some attention. Images and movies acquired in the early morning will measure dust and look for clouds, while images and movies at mid-day will measure dust and look for dust devils. REMS and RAD will gather data regularly as the weekend progresses. The second sol is the centerpiece of the plan, when we attempt to sink the drill into the Duluth block. Before drilling, MAHLI will capture "before" images of the drill target, and MAHLI and Mastcam will image the areas where different portions of a drill sample could be dumped both before and after sample delivery to SAM and CheMin. Then, drilling commences. Once the drill hole is created, ChemCam will image the hole with its RMI to set up for shooting the laser down the drill hole in subsequent sols, and Mastcam and Navcam will image the post-drill workspace. The engineers have worked incredibly hard to invent a new way to use the drill, as highlighted in this recent story. Their ability to work around the problem from afar and give us another chance at drilling is very much in the spirit of NASA's engineers designing fixes to the systems of Apollo 13 as the spacecraft hurtled, crippled, to the Moon. Although the stakes are different for MSL, the ingenuity is the same. The science team has been wondering what minerals might be responsible for the layers, veins and nodules in the Blunts Point rocks. A successful drill will mark the first step in answering that mystery. Suffice it to say, the whole MSL team - scientists and engineers - will be waiting with bated breath for the data that reveal if the drilling was successful. Success will feel very much like *finally* getting to open that shiny birthday present after a long, enticing wait!